Despite being at the 'more affordable' end of the digital medium format camera market, the Pentax 645Z is solidly built and weatherproof. It's also easy to use and produces superb images with huge amounts of detail. As a medium format camera the Pentax 645Z has a sensor that's considerably bigger than the sensors in full frame cameras such as the Nikon D810 and Canon 5D Mark III. In fact, as it measures 43.8x32.8mm, it's around 1.68x their size. Unlike the Pentax 645D that the 645Z replaces, the new camera has a Sony CMOS sensor, which should be good news for noise control. What's more, the pixel count has been boosted from 40 million to 51 million, so detail resolution should be very high. However, this has been boosted further by the fact that, like Hasselblad and Phase One medium format cameras with the same chip, there's no anti-aliasing filter. Pentax has also coupled the sensor with a PRIME III image engine, first seen in the Pentax K-3 APS-C format SLR. This enables up to 10 raw images (or 30 images large highest quality JPEGs) to be shot at a maximum speed of approximately three frames per second (fps). There are a few other significant upgrades. The maximum sensitivity setting, for example, is now ISO 204,800, significantly higher than the ISO 6400 maximum offered by most other medium format cameras. There's also a tilting 3.2-inch 1,037,000-dot LCD screen which is capable of showing a Live View image and Full HD (1920 x 1080 pixels) movies may be shot at 60i/30P in H.264 format. In addition to the built-in stereo microphone, the 645Z has a stereo mic port and audio level control is possible. Pentax has also given the 645Z the SAFOX 11 phase-detection autofocus (AF) system found in the K-3. This has 27 AF points, 25 of which are the more sensitive cross-type. It's also capable of working down to -3EV. Exposure can be controlled manually or automatically with information being provided by the Pentax Real-Time Scene Analysis System. This consists of an 86,000-pixel RGB light-metering sensor and an algorithm. Pentax claims this improves on exposure-control accuracy and it provides data to enhance autofocusing accuracy and white-balance adjustment. There are also two SD/SDHC/SDXC card ports, with the second port compatible with Flu cards to allow wireless shutter release and image transfer and via a smartphone. Pentax has used the same design and control layout for the 645Z as it did for the 645D, so those upgrading will find the transition pretty smooth. The body is covered fairly liberally with controls that give a quick route to key features such as sensitivity, white balance and exposure compensation. However, there's a limited number that can be customised to access alternative features, just the RAW button on the top-left of the camera and the (LCD) Illumination button. The RAW button is intended to allow users to switch quickly from shooting JPEG images to raw files, or from raw files to simultaneous raw and JPEG capture. I find it hard to imagine that many medium format camera users would want to move away from raw files in many situations. Fortunately, this button can be set to Optical Preview (depth of field preview) or Digital Preview. Digital Preview captures an image at the selected settings for examination on the camera's screen, but it isn't written to the card. The Illumination button can be used to trigger a compatible flashgun to emit a modelling flash or a test flash. Meanwhile the AF button can be set to allow back-button focusing, where the AF function is removed from the shutter release and the Preview Dial around the shutter release can be used to access Optical or Digital Preview. There are however, three User mode settings can be saved for access via the main mode dial. It's also possible to save a new name for each User setting to help remind you of the key features. However, this name is only shown briefly on the main screen after turning to the option on the mode dial and it isn't displayed on the information screen that appears when OK is pressed – the original name, User1, User2 or User3, is shown instead. I suspect this could be rectified by a firmware upgrade. Like the 645D, the 645Z has seals that make it weather and dust resistant. It also has the same deep grip and, despite its larger size and relatively heavy weight (over 1.5Kg without a lens), it feels comfortable in the hand. It really is feasible to use this camera hand-held, and thanks to its impressive sensitivity range it is possible that this camera will be used so more than any other digital medium format camera. I used the camera with a weather resistant lens mounted for about 30 minutes in persistent drizzle and didn't encounter any problems. Despite the water on the grip and covering the buttons and dials it continued to function correctly, and I was able to keep a good grip on it. At first glance it may seem that those with small hands may struggle to adjust some settings on the camera, but rather than needing to press a button while simultaneously scrolling a dial, most adjustments can be made either with a single press to select the desired option and then using a dial or repeated pressing of a button. 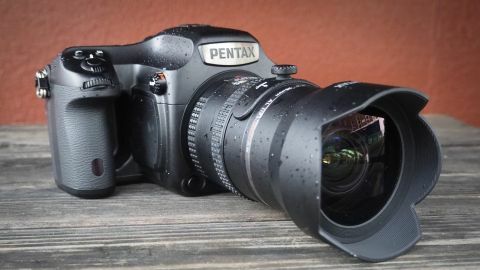 As the user interface is fairly similar to that of Pentax's K-series cameras it's very easy to get to grips with the 645Z, and even those who have never used a medium format camera before will soon feel comfortable using it. That said, the menu looks very dated. Although there are 27 individually selectable AF points, they are all clustered quite close to the centre of the image frame, so the focus-and-recompose technique comes in handy on many occasions with off-centre subjects. Being an SLR, the 645Z has a reflex mirror that lifts to allow an exposure to be made. Naturally this is quite a large unit and, while it's not quite the door-slam of some medium format models, you are certainly aware of its movements. It's helpful that it's possible to set mirror lock-up mode directly via a switch on the side of the camera, as this is likely to be used for studio work. The viewfinder is large and bright, but with 98% coverage it doesn't quite display the whole image and you can expect to find the odd extra inclusion around the edges of the frame on occasion. The LCD screen is also clear and provides a detailed view, whether composing using Live View mode or reviewing images. The fact that the screen tilts is especially useful when composing images on a tripod in the studio or when out shooting landscapes. It's also helpful that the screen's display can be set to rotate to make it easier to read when shooting in upright format. While the screen provides a clear view indoors, it is much harder to see outside on the default settings. Pushing the brightness value to the maximum helps, but you'll need to check the histogram to be sure that the image is correctly exposed.